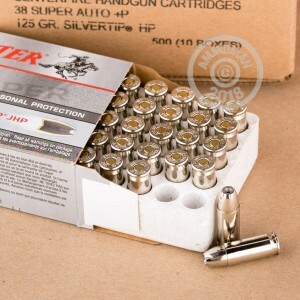 Your 1911 or other .38 Super handgun makes a formidable weapon for self-defense with this Silvertip ammunition. 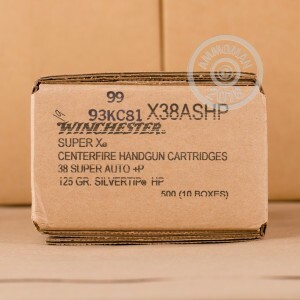 Each cartridge in this box of 50 fires a 125 grain jacketed hollow point projectile at 1,240 feet per second. 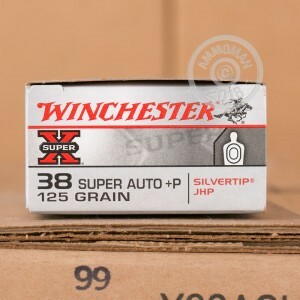 Unlike many target loads, this ammo takes greater advantage of the .38 Super's potential to deliver high velocity; this enhances the bullet's expansion potential for superior terminal performance.